Personalized Travel Toothbrush Kits Custom Printed in Bulk. Promotional, Very Inexpensive. Lowest prices in the USA and Canada. 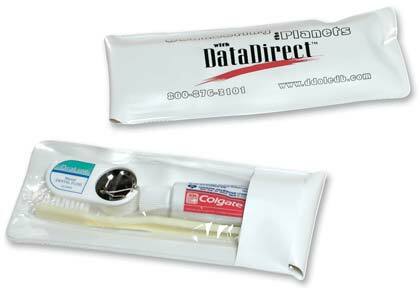 High quality, yet inexpensive promotional Travel Toothbrush Kit in bulk, custom imprinted. We also supply blank (not personalized) bulk Travel Toothbrush Kit for $3.10 each. Free artwork design and Free proofs! American clients pay no taxes. The unit prices below include your 1-color custom imprint on one side. Add the amount shown for each additional imprint color. We also supply blank (not custom imprinted) bulk Travel Toothbrush Kits for$3.10 each. Vinyl envelope contains toothbrush, dental floss and .85 oz. (25 g.) tube of Colgate toothpaste. Case Size: 3" x 7"
Product Color: White with clear back. PRODUCTION TIME: 7 days after art approval; Rush 3 day production is available: add $0.45 per kit. Blank kits ship next day.